View of the flat back side of the pot. It is unusual for the back side of bough pots to be printed. In this case, Spode has added the additional printed Standard Willow pattern. 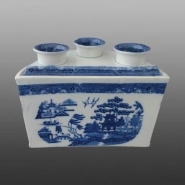 A demilune shaped pearlware bough pot printed underglaze in blue with the Standard Willow pattern. The decorative molded base is highlighted with hand painted blue lines. The pattern is also printed on the back side (see below). Although it is not marked, it can be attributed to Spode based on the shape which matches other marked examples.